Place an egg separator over a small bowl. Crack open 1 egg over the egg separator to seperate the yolk from the white; then separate the other egg. (Save the whites for another recipe.) In a small bowl, place the yolks. Beat the egg yolks with a fork or wire whisk until mixed. Stir in 1 1/2 cups milk; set aside. In a 2-quart saucepan, stir 1/3 cup granulated sugar, the cornstarch and 1/8 teaspoon salt until mixed. Gradually stir egg mixture into sugar mixture. Cook over medium heat, stirring constantly, until mixture thickens and boils. Boil and stir 1 minute; remove from heat. Stir in 2 teaspoons vanilla. Press plastic wrap on surface of filling to prevent a tough layer from forming on top. Refrigerate at least 2 hours until set but no longer than 24 hours. While filling is chilling, continue with recipe. Heat the oven to 350°F. Spray just the bottom of a 9-inch round cake pan with the baking spray. In a large bowl, beat all cake ingredients with an electric mixer on low speed 30 seconds, stopping frequently to scrape batter from side and bottom of bowl with a rubber spatula. Beat on high speed 3 minutes, stopping occasionally to scrape bowl. Pour batter into the pan; use a rubber spatula to scrape batter from bowl, spread batter evenly in pan and smooth top of batter. Bake about 35 minutes or until a toothpick inserted in the center comes out clean. Cool cake in pan on a cooling rack 20 minutes, then remove onto cooling rack to finish cooling completely, about 1 hour. In a 1-quart saucepan, melt 3 tablespoons butter and the chocolate over low heat, stirring occasionally. Meanwhile, in 1-cup glass measuring cup, microwave the water uncovered on High 15 to 30 seconds or until hot. Remove chocolate mixture from heat. Stir in the powdered sugar and 3/4 teaspoon vanilla. Stir in 3 tablespoons hot water. Stir in additional water, 1 teaspoon at a time, until icing is smooth and thin enough to spread. To split cake horizontally in half, mark middle points around side of cake with toothpicks. Using toothpicks as a guide, cut through the cake with a long, sharp knife, using a back-and-forth motion. On a serving plate, place bottom layer with the cut side up. Spread filling over bottom layer. Top with top of cake, cut side down. Spread glaze over top of cake, using a metal spatula or back of a spoon, letting some glaze drizzle down side of cake. Refrigerate uncovered until serving. Store any remaining cake covered in the refrigerator. Using toothpicks as a guide, cut through the cake with a long, sharp knife, using a back-and-forth motion. Don’t be fooled by the name, this “pie” is actually a wonderfully decadent cake. This scratch recipe is the perfect one for Boston Cream Pie lovers and baking purists alike — though if you’re in a rush, readers comment they have made this successfully with a Betty Crocker yellow cake mix. 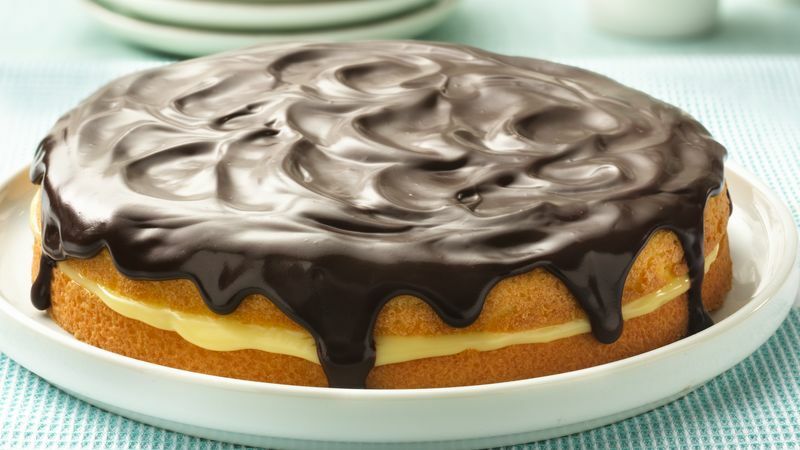 This scratch Boston Cream Pie consists of two layers of sponge cake held together with a custard filling and topped with a rich chocolate glaze. To guarantee that your sponge cake has a light and airy texture, beat room temperature eggs until foamy — using cold eggs will make your sponge fall flat. When making the custard, take care to follow the directions closely. You want to end up with a pudding-like texture, so don’t overcook the custard — as the recipe says, boil it for only one minute. One related tip, you can make your custard up to 24 hours ahead to save on time day of. Finally, when making the chocolate glaze, remember to add the hot water only after you’ve removed the chocolate mixture from the stove. This will prevent the chocolate from seizing — when the chocolate becomes clumpy and loses its velveteen texture. While certainly a labor of love, this recipe is worth the effort and makes a birthday, anniversary or any other celebration extra special! If you’re ready to explore other types of cream pies, we’ve got plenty more recipes where this came from.